What is Seaweed & How Can it Benefit My Fertility? Home → 40+ → What is Seaweed & How Can it Benefit My Fertility? What is seaweed and how can it benefit my fertility? Seaweed is beneficial for fertility health for many different reasons. Seaweeds, also known as sea vegetables, are very high in nutrition. In fact, they contain 10-20 times the vitamins and minerals of land vegetables. The minerals in sea vegetables are chelated and colloidal, which makes them highly bioavailable. Bioavailability means how fast and how much of the substance consumed (usually in reference to supplements) is absorbed and utilized by the body. Seaweeds have minerals that are readily and easily used by the body; this includes calcium, iron, zinc, magnesium, manganese and selenium. Seaweeds are also high in protein for a plant source. Some varieties contain as much as 48% protein. These sea plants also provide a good source of fiber in the diet. Sea vegetables are abundant sources of antioxidants and contain sodium alginate. Sodium alginate cleanses the blood and tissues of the body. Seaweeds contain vitamins A, B, C and E.
Seaweeds are best known for their high iodine content. Many species have been found to cleanse the body of heavy metals and radioactive materials. In fact, after the devastating effects of the radiation catastrophe in Chernobyl, it was seaweed that was used to help treat patients exposed to high levels of radiation. Adequate amounts of iodine-rich foods in the diet have been found to protect the thyroid. The thyroid is very sensitive to poor diet and environmental toxins. It plays a key role in our body’s metabolism. The thyroid releases the hormone thyroxine; this is needed for proper metabolism, growth, and development. Iodine in our diets is essential for thyroxine synthesis. Proper function of the thyroid is not only essential for our metabolism, but for development and function of our central nervous system. I have seen many people successfully heal thyroid issues by consuming more iodine rich foods such as seaweed, yet not everyone with low thyroid can rely alone on seaweed or iodine added to their diet. It is also just as important to limit how much seaweed you eat; too much iodine can be damaging. 2-3 servings a week should be adequate (refer to the next paragraph for TCM recommendation for consumption in relation to infertility). Many women who experience fertility issues have found that their thyroid is playing a role in their struggles. Stress alone from fertility problems can be extremely hard on the nervous system and, in turn, the thyroid. Be sure to nourish your body with adequate amounts of seaweed. According to some Traditional Chinese Medicine (TCM) practitioners, seaweed eaten daily in small amounts (two tablespoons per serving) can help to strengthen the liver, kidneys, bladder, and adrenals. All of these areas of our body are important for healthy fertility. In TCM, kidney deficiency contributes to infertility. The high nutritional content of seaweeds contribute to healthy fertility overall. The high fiber content is extremely important for proper blood sugar levels; this is something to consider if you suffer from PCOS. Fiber also helps to remove excess estrogen in the body; this is very important for fertility issues such as endometriosis, PCOS, ovarian cysts, and uterine fibroids, all of which are estrogen dominant conditions. Agar: This seaweed is popular for making gelatin-like desserts (see strawberry mousse recipe below) because of its jelly-like quality. It is found under the name Agar Agar as well. It is high in iodine and is often featured in salads. It is a white to clear seaweed. Arame: This seaweed is best in vegetable dishes due to its slightly salty taste. It is high in calcium, iodine, potassium, vitamin A and B.
Dulse: Dulse contains 4 times more iron than spinach!! It is high in vitamin B6, vitamin C, and potassium. Hiziki: This sea plant has a very strong flavor that is masked well by apple juice or sweet vegetables like corn or sweet potato. It has 10 times more calcium than a glass of milk. 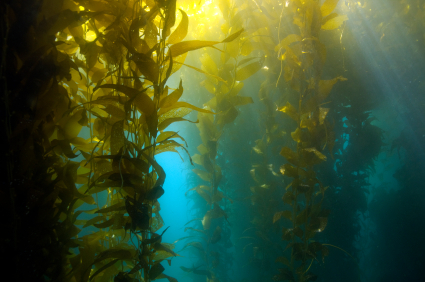 Kelp: This sea veggie is high in minerals including, calcium, potassium, magnesium, iron, chromium, and iodine. Kombu: This plant is high in calcium, iron, potassium and vitamin C.
Wakame: Wakame is abundant in calcium, iron, iodine, phosphorus, potassium, and the vitamins A & B.
Soak Wakame in warm water. While Wakame is soaking, combine first 3 ingredients to allow ginger to permeate the vinegar, while you slice the cucumber and grate the carrots. Lightly salt cucumber slices. Toss vegetables with the vinegar mixture. Drain and cut the Wakame – toss into salad. Cover and refrigerate for 3-4 hours. Just before serving, sprinkle with sesame seeds. This is a great one to boost minerals in your body! It is relatively quick and easy, plus it is very nourishing. My family loves it! 1. Place garlic, carrots, sea vegetables, and water or stock in to a soup pot. Cover and bring to a boil over high heat. Reduce heat and simmer for 10 minutes or until carrots are tender. 2. Stir in greens and ginger. Simmer for 3 minutes. 3. Remove from heat. Stir in miso. 4. Add a little sea salt or soy sauce (preferably organic wheat-free tamari) if desired. 5. Serve with sprinkled parsley or cilantro. 1. In a small stainless-steel saucepan pour 2 cups apple juice. Sprinkle agar agar flakes on top. Bring to a boil over medium heat. Reduce heat and simmer for 5 minutes, stir occasionally. Remove from heat. 2. Pour into a blender remaining 1/4 cup of apple juice. Add cashew butter, and strawberries. Puree; you may leave it slightly chunky. 3. Stir puree mixture into the apple juice/agar mixture in pan. 4. Pour the mousse into 4 individual serving dishes. Chill for at least 1 hour or until firm. 5. Top with whipped cream (optional) and fresh strawberry. 1. Soak peas in plenty of water overnight or for at least 4 hours. 2. Drain peas, rinse. Place peas and water in a heavy stock pot. Cover and bring to a boil. Reduce heat and simmer for 30 minutes or until peas are tender. 3. Stir in arame, tamari, syrup, ginger, and vinegar. Let stand for 5-10 minutes. 4. Serve with chopped fresh parsley or cilantro. Dried seaweed is easy to use. I add it to a variety of dishes throughout the week. It is quick to use and a little goes a long way. Consuming seaweed regularly can be a smart addition to your Natural Fertility Diet! Some of our favorite fertility products contain seaweed for both nutritional and thyroid support. Conceptions Tea contains Hijiki (hiziki). Fertilica FertiliGreens contains Sea Whistle and Ecklonia, both of which are a type of kelp. ThyroFem also contains kelp. Do you have a favorite seaweed? Have you ever tried seaweed? What is your favorite seaweed recipe? Are you a person who has used seaweed for healing a thyroid issue? Do you use it for fertility support or general health? We would love to hear from you! *Adapted from The Vegetarian Mother’s Cookbook by Cathe Olson. Monte, T. (1997). The Complete Guide to Natural Healing. Perigree Books. Is there a brand of seaweed salad already made this can be bought. I’ve seen seaweed salad in stores and it seems a lot easier to just buy it already made. Thank you. I would think some grocery store or co-op delis would have fresh seaweed salads to purchase. I would avoid anything packaged in the main grocery aisles or with added preservatives that are not natural. Sushi restaurants may have some that one could purchase as well. Focus on fresh, made daily salads. I’m not quite sure from this article if packaged dried seaweed and dry roasted seaweed snacks are as valuable as fresher forms. Would you consider them all equal, as long as they are high-quality? If they are high-quality and minimally processed, these seaweed foods are fine. The drying process typically involves little to no heat, which is what is most likely to damage nutrients. If I put seaweed in a fertility smoothie, would it affect the taste or blend right in like spinach and kale? I have not personally tried sea vegetables alone (I have in a green superfoods mix, FertiliGreens, though), but I have heard Kelp powder and dulse flakes blend best into green smoothies. Sea vegetables can be salty and “oceany” in flavor so start with a small amount and work up from there to your liking. Is sodium alginate in all seaweeds? Is it in Dulse? It is found in brown seaweeds, so no, it appears the answer is no. Dulse is a red seaweed and after looking into it more, it appears to not be in Dulse. What a question! Thanks for keeping me on my toes. Hi just wondering if you can help me please. I have just been reading about how seaweed can aid in fertility. is it possible to take the seaweed via tablet form instead of seaweed straight . Would love to hear everybodies ideas as well. You could, but seaweed eaten as a whole food is easier to digest in my opinion. Make sure you are purchasing a very clean source of seaweed products. I like Eden Organics.